If you have already learned about systems of linear equations, then you have probably discussed that the product of the slope of perpendicular lines is . The proof of this theorem comes from the fact that any point rotated 90 degrees at about the origin becomes . One example of this is shown below. The point , when rotated degrees counterclockwise becomes . With this fact, we prove this theorem. If two lines with slopes and are perpendicular, then . 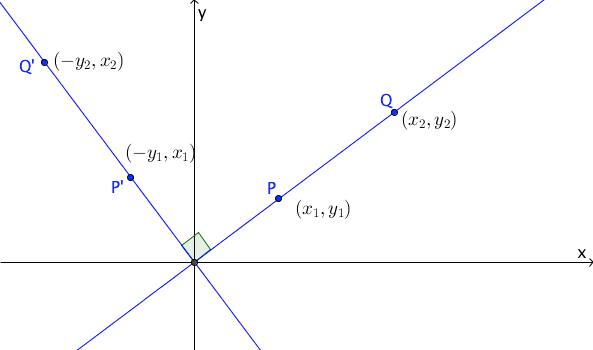 Let and be points on line passing through the origin. That proves the theorem above.